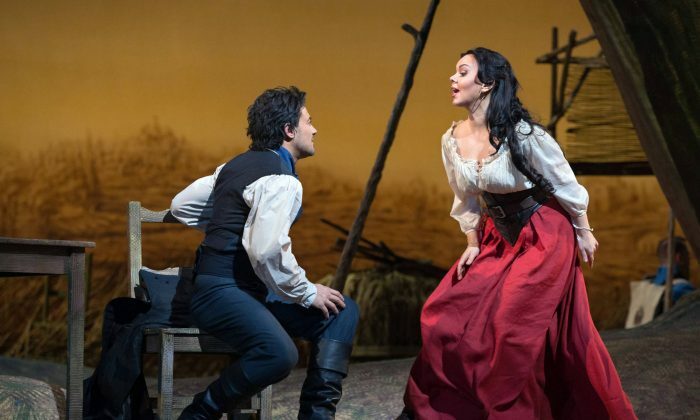 NEW YORK—This season, the Metropolitan Opera has been performing a number of the works of Gaetano Donizetti (1797–1848): the dramatic “Three Queens” trilogy and two of his most popular comic operas. 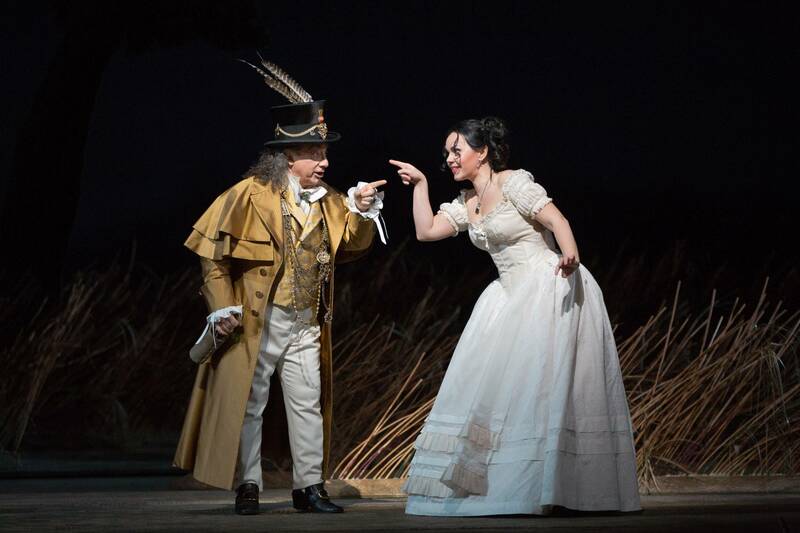 Recently, “Don Pasquale” opened to charm audiences, and now the equally entertaining “L’Elisir d’Amore” (“The Elixir of Love”) has arrived. Bartlett Sher’s production opened the Met season in 2012. The new cast is just as winning as the earlier one. “L’Elisir d’Amore” combines silly comedy with pangs of emotion. The plot concerns a country bumpkin named Nemorino, who is in love with the more intelligent Adina. She reads books and tells the villagers the story of how Tristan won the heart of Isolde by drinking a love potion. When Dulcamara, a seller of fake medicines, arrives in town, he tricks the gullible Nemorino into buying an elixir, which is supposed to cure everything from boils to bed bugs but is really Bordeaux wine. Meanwhile, Adina is being wooed by a narcissistic army officer, Sergeant Belcore. She agrees to marry the officer to get even with Nemorino, when he feigns indifference to her. The young man, needing cash to buy more of the potion, signs up for the army after Belcore offers him a bonus to volunteer. After drinking the liquid, Nemorino finds that hordes of young women are pursuing him. While he thinks the reason is Dulcamara’s drink, in actuality word has spread that Nemorino has inherited a fortune from his recently deceased uncle. Adina confesses her love and the two finally unite. Belcore takes her rejection well, expressing his belief that many other women will swoon over his charms. Dulcamara takes the credit for everything, from the satisfying romantic ending to the young man’s inheritance. Director Bartlett Sher claimed that his production stresses the political implications of the libretto by moving the action a bit later to 1836, to coincide with the Risorgimento (the drive for Italian independence). In his view, the locals are Italians and the soldiers, including Belcore, are Austrian. I doubt that many people in the audience picked up on these subtleties. 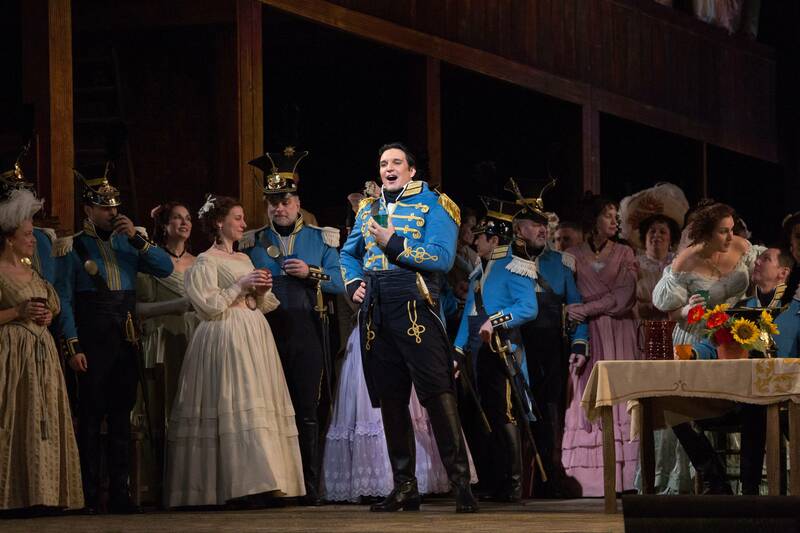 The cast is certainly up to the vocal and dramatic demands of the opera. As Nemorino, tenor Vittorio Grigolo is likeable and brings the house down with “Una furtiva lagrima,” the most famous aria in the opera. He looks young and bounds around the stage with the nervous energy of a teenager. Aleksandra Kurzak is an entrancing Adina, singing with grace and beauty and acting with charm. She also moves well and even dances a little. Her rendition of the aria “Prendi, per me sei libero” was exquisite. The towering baritone Adam Plachetka is a swaggering Belcore. Alessandro Corbelli is well-suited to the comic role of Dulcamara even if his voice is not especially rich. 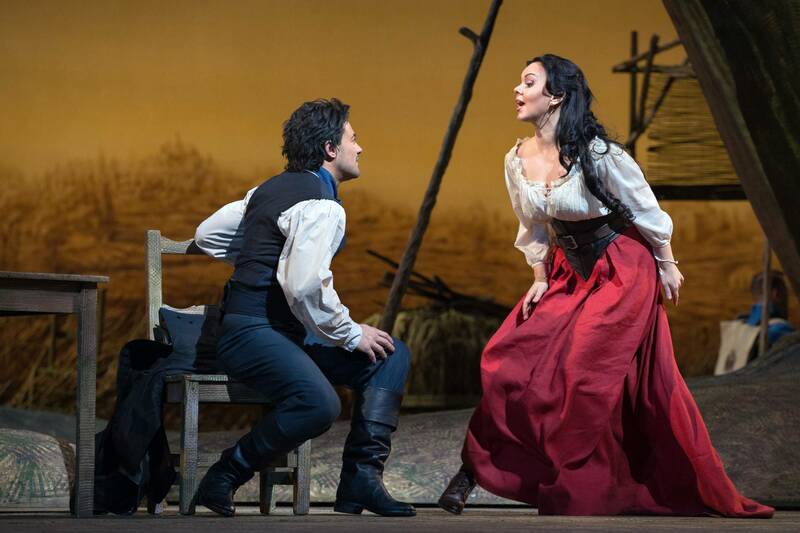 Soprano Ying Fang made a strong impression in the brief role of Giannetta and is clearly a talent to watch. With Enrique Mazzola conducting, the orchestra and chorus sounded fine. 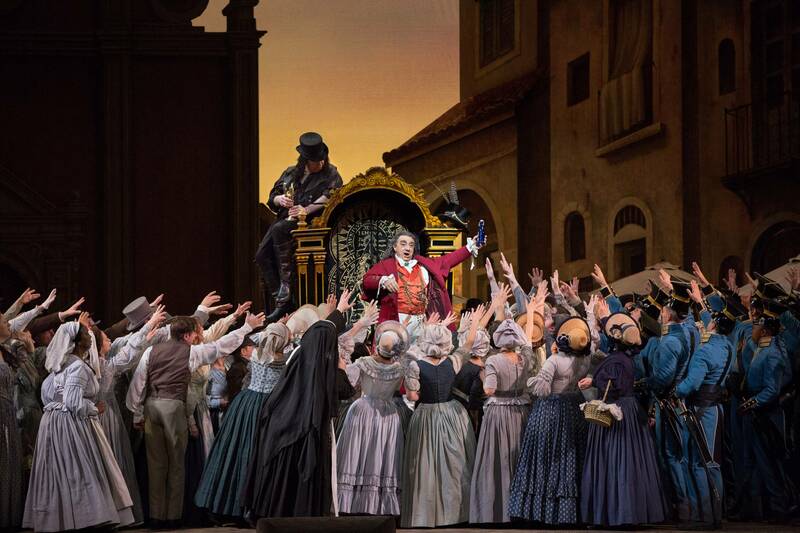 Beginning April 2, Mario Chang sings the role of Nemorino, and Pietro Spagnoli plays Dulcamara. Joseph Colaneri will conduct the April 7 performance.